Upright Piano pop up card - Want to find a pop up piano to gift your loved one? You can think of our amazing Upright Piano Pop Up Cards. As you can see, the white cover of the card depicts a beautiful piano. It seems to reveal a distinctive 3D sculpture inside. When the card is opened, we are sure that you will not be able to hide the surprise. It is still the piano of the cover but now, it has become so lively. That is a charming piano with some nice decorations. In addition, the background of the card is decorated with a fussily carpet. Music brings people together, just like our cards do. We wanted to combine the two and create the ultimate bonding card. No one can resist the flying and melodious sounds emanating from the piano right? Gift this card to the music lovers and piano enthusiasts in your life. Show them how much you appreciate those late night get-together of piano strumming and harmonious singing. This card is perfect for all occasions - from Mother’s Day to birthdays to just because. And do not forget to write lots of good wishes on a blank sheet of paper inside the card before sending it! We hope you will enjoy it! 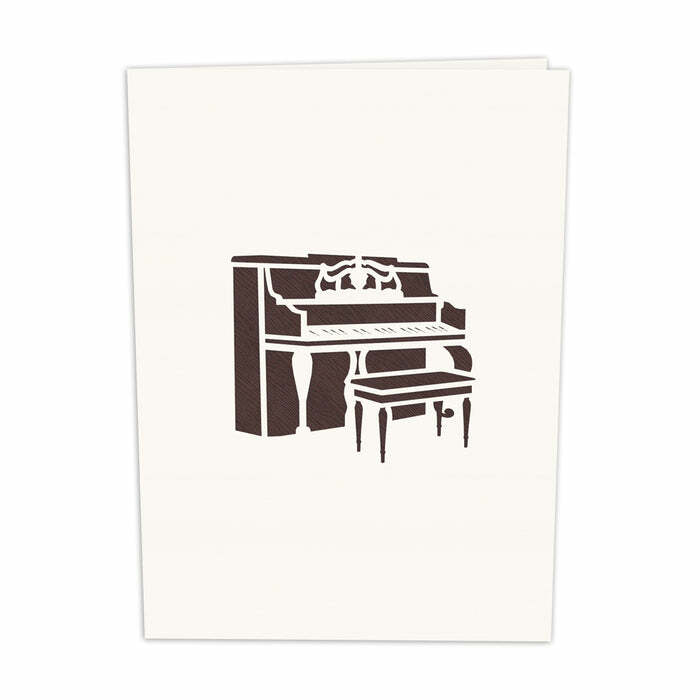 The Upright Piano Pop Up Card is 5 x 7 inches. One lovely Color Pop card will come with white envelope & Color Pop Label.